On August 6, 1945, President Truman took to the radio to announce that "the first atomic bomb was dropped on Hiroshima, a military base." Truth be told, only about 15% of the 140,000 people killed by the blast were Japanese soldiers. Nevertheless, the history books have routinely ignored the fact that the vast majority of the casualties were civilians, in favor of crediting the Manhattan Project, a top secret scientific project, for the mammoth explosion hastening the conclusion of World War II. If you've ever wondered what it might've been like to live in Hiroshima before it was vaporized, submitted for your approval is In This Corner of the World, an evocative anime presented from the perspective of a young woman born and raised in the ill-fated city. 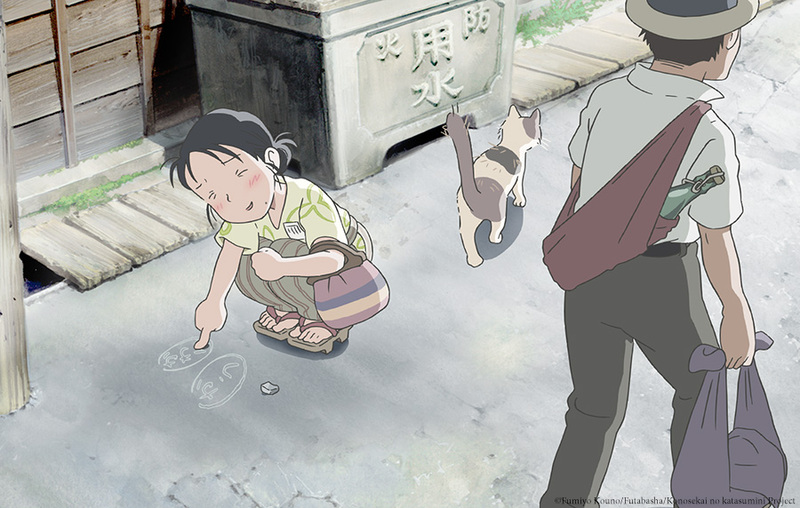 The poignant tale covers over a dozen years in the life of Suzu Urano (Rena Nouren), an aspiring artist with a vivid imagination. The story unfolds in 1933, when we find her dream of drawing as a vocation frustrated by her having to work in the family seaweed business. That hope grows even fainter after the outbreak of the war when resources become rationed and just finding pencils to doodle with proves to be an exercise in futility. The plot thickens when she is courted by Shusaku (Yoshinasa Hosaya), a sailor from a neighboring seaport called Kure. After they wed, she relocates to the city, and resides with his family for the duration of the hostilities. That means she's away from her hometown on the fateful day that it's blown to smithereens. Nevertheless, she's deeply affected, as so many people and places dear to her heart disappear in an instant. A timely morality play, indeed, given the dire apocalyptic threats currently being traded between the unhinged leaders of America and North Korea.